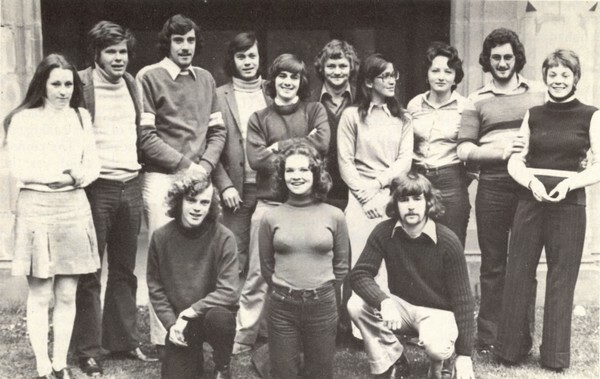 The Melbourne University Law Students' Society in the mid-1970s. Graeme Rees-Jones attended his first meeting with the MULSS in the Old Arts Building in 1954. “The theatre was packed with eager young freshers and much excitement at their first meeting”, he says. In 1956, Mr Rees-Jones was elected Secretary of MULSS. In those days the MULSS Secretary organised a yearly “Downtown Rag”; a kind of joke activity involving students in the public space of the city. It was a significant year for Melbourne with the introduction of television and the staging of the Olympic Games. Mr Rees-Jones says in accordance with the Olympic theme, he organised a gathering of law students in the national dress of numerous countries to gather in Collins Street outside the steps of the Australia Hotel. There they would hear a speech of welcome from a pseudo Lord Mayor. “The actors gathered in their costumes and to the surprise of everyone, the elegant Nat King Cole appeared at the top of the steps of the hotel to the cheers and applause of the crowd. Of course, he assumed that they were his fans so waved and smiled for some time,” he says. Current MULSS President Anna Francesca Belgiorno-Nettis organises the yearly “Welcome Back Garden Party” for continuing and commencing JD students at MLS. Ms Belgiorno-Nettis recounts a particularly bleak day for the outdoor event, where a week of constant rain had softened the ground and created a barrier to most outings. The MULSS Committee had the event ready to go, complete with catering and a band, but were concerned that no one would show. “As the clock ticked towards the conclusion of law lectures for the day, a few students trickled in. 30 arrived and we were relieved. Another 30 came and we started smiling. In the end we had 100 or so students with gumboots, raincoats and umbrellas clustered together for slightly soaked crackers in less than clear twilight”, she says. Ms Belgiorno-Nettis says such friendships will brighten the future for these MLS students. “Those 100 students didn’t only come for cheese, they came for each other”, she says. The Melbourne University Law Students' Society in 2016. Next year will be the 160th anniversary of Melbourne Law School. As part of the anniversary celebrations, we are seeking contributions from all MLS alumni for our special, commemorative edition of MLS News, to be published in 2017. Do you have recollections you would like to share from your time studying law? What was your most memorable moment at the Law School? Please contact Roselina Press, Media and Communications Coordinator (Acting) with 200-500 words recounting one or two of your favourite memories. We would love to hear from you.